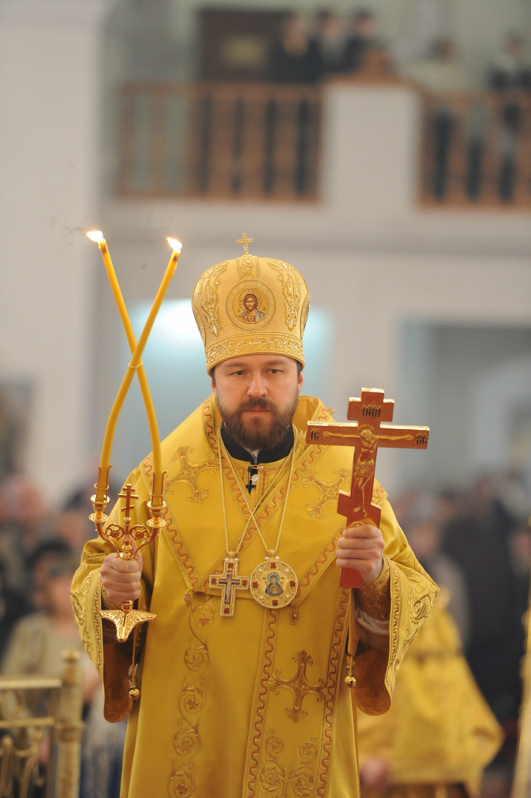 On December 19, 2012, the Day of St. Nicholas the Archbishop of Myra in Lycia, Metropolitan Hilarion of Volokolamsk, head of the Moscow Patriarchate’s department for external church relations, celebrated the Divine Liturgy in St. Nicholas’s-on-Three-Hills. Greeting Metropolitan Hilarion after the service, Archpriest Vsevolod Chaplin, head of the Synodal department for church-society relations, said in particular that the unity of the bishop and the people of God and the archpastor and clergy and mutual support have always been present in the life of the Church, constituting one of the corner-stones of church life and the power of the Church. ‘This gives us confidence that despite all the tempests of life and all the talks that the church cause will die and that there are more powerful social strata before which the Church has to step back, the cause of Christ will always continue in the world, and the church service will always be carried out’, he said. Metropolitan Hilarion, in his archpastoral homily, spoke about St. Nicholas as the most revered saint in Russia. The reason for this reverence ‘does not lie in the historical circumstances of the saint’s life but in the spiritual experience that thousands and even millions of Orthodox Christians associate with him’. ‘We know that St. Nicholas was quick to harken. He comes to our aid in the most difficult of situations, when we are in trouble, sorrow and need’, he said. Metropolitan Hilarion noted that the Church of St. Nicholas-on-Three-Hills was the church belonging to the Synodal Department for Church-Society Relations established by the Patriarch and the Holy Synod. Addressing Father Vsevolod, he stressed that the Church should address the needs of society and the Synodal Department headed by Father Vsevolod is responsible for the Church’s dialogue with it. ‘You direct the people who address society on behalf of the Church, and in this endeavour there can be no example better than that of St. Nicholas. A person who addresses society on behalf of the Church should be the rule of the faith and the model of humbleness, just as St. Nicholas was. His words should convince people. He should be credible and the way of his life and his deeds should inspire people to follow him. ‘He must be a model of humbleness and at the same time fearless when the need arises to defend the Church, just as St. Nicholas was when he pinched the heretic Arius. And we too must be resolute in our opposition to the forces which attack the Church, slander her, trying to distort her image. We should be ready to give a rebuff to all the enemies and slanderers while keeping humble and inwardly calm. ‘It is a difficult and very important task because one tends to lose one’s self-control and peaceful spirit when one has to enter into polemics with enemies of the Church. But it is a special responsibility that the Church has placed on us. We have to be accountable to the external world and external forces for the way in which our Church lives and believes and to represent the Church in a dignified way in public space’, His Eminence Hilarion said. The metropolitan, acting on the blessing of His Holiness the Patriarch, presented Archpriest George Roschin, vice-chairman of the Synodal department for church-society relations, Mr. Yu, Artyukh, head of the municipal department for relations with religious organizations, his deputy K. Blazhenov, and R. Silantyev, director of the DCSR’s Religious Geography Center, with the Medals ‘In Commemoration of the 200th Anniversary of the Victory in the 1912 Patriotic War’.